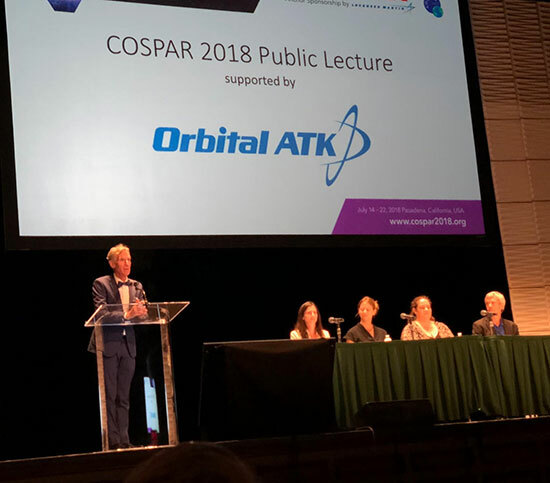 Well here we are at day 4 and 5 at COSPAR 2018 and this blog presents a summary of some topics that especially got my attention. First up, was the COSPAR public lecture by Professor Sara Seager, MIT who spoke on "Mapping the Nearest Stars for Habitable Worlds." She discussed the techniques used now to discover exoplanets and then described the planned Star Shade satellite system, which consists of two controllable satellites, one of which places an occulting star shade, to block the light from the star, and the second satellite, located quite a distance away, with its telescope pointed directly at the occulted star, and should be able to see exoplanets. The benefit of this new technique is that the exoplanets do not need to be so aligned as to transit the star and they should be seen directly by their reflected light. After her speech she was part of a panel discussion led by Bill Nye, The Science Guy, and the Planetary Society CEO. The panelists talked about their favorite solar system planet that they considered to warrant the next exploratory search for past or present life. 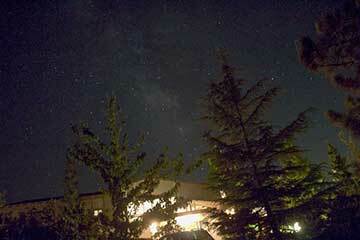 The favorites included Mars and the icy and ocean moons of Jupiter and Saturn. One of the most dynamic speakers was Professor Karsten Danzmann who described the success of the LISA Pathfinder satellite and how LISA has received ESA approval to go forward. Remember LISA is the next proposed version of gravitational wave detectors that will be launched into space in about 2030 and consists of three separate satellites that make up a triangular, 3 leg interferometer. 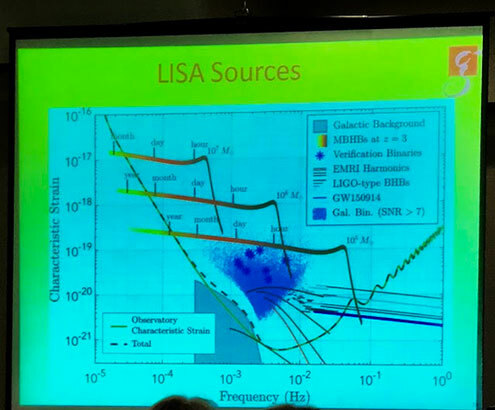 The reason for LISA is that it can detect gravitational waves of much lower frequency. In fact, it will be able to detect continuous wave emission from binary compact objects, well in advance of the actual merger of those objects. He said that the prototype technology demonstrator, Pathfinder, already demonstrated that it exceeded its technical requirements and actually even met and surpassed the LISA requirements. My photo of the slide is a little blurry, but you can, hopefully, make out that the frequency range. He said that LISA will be able to detect millions of binary pairs well in advance of their actual merger. 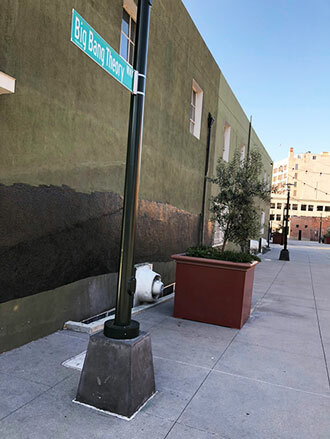 Attending COSPAR 2018 in Pasadena doesn't mean we are always inside the Convention Center and here we found the street and street sign shown in the photo below. The Big Bang Theory, is both a cosmological theory and a popular TV show based in Pasadena and Caltech. I walked by the street several times now and have yet to see any of the TV show characters, or anyone for that matter, there! Oh well, its time to get back to COSPAR! My goal at COSPAR was to sit in on many different types of technical sessions, many dealing with topics which I didn't really have much experience. The photo below shows one of Bill Bottke's, SWRI, slides from his presentation on the ongoing theories about solar system formation. He outlined the two main contending theories: The Grand Tack Model and The Nice Model. Both models try to explain how the solar system formed and how some planets formed in one orbit and then moved in and out to different orbits because of dynamics and instabilities that occur as the protoplanets and gas and dust contract to form the sun and planetary disk. 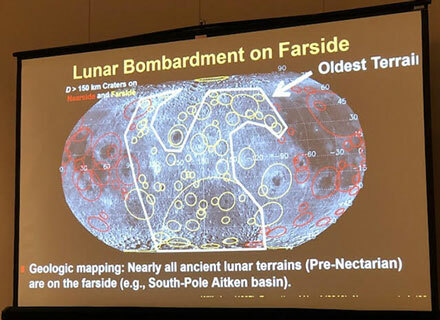 Dr. Bottke favors the Nice Model and this slide explains how an examination of the crater sizes on the moon, which mostly happened during the lunar bombardment phase of solar system history, can be used to determine the sizes of planetesimals and asteroids that had to be present during that time. The size of the objects that collided with the moon is used to assess the state of the solar system at that time and can then be used to support one or the other leading theories of solar system formation. I attended several sessions on the nature of cosmic rays. 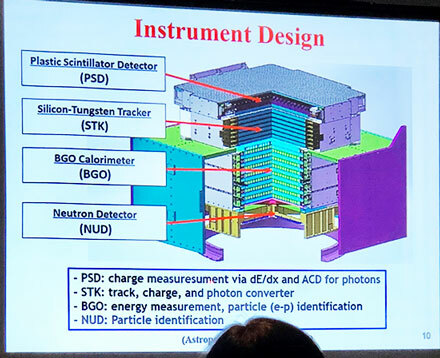 One topic that was pretty interesting was the types of detector used to monitor and detect cosmic rays. Previously we had learned that the radiation from background radioactivity is measured to be about 10 times as much as that from cosmic rays at the surface. What is more important in understanding the sources of cosmic rays and how they reach such high energies is to monitor the incoming cosmic rays with spaced sensors. One example is the DAMPE (Dark Particle Explorer) sensor, which is installed on the ISS. 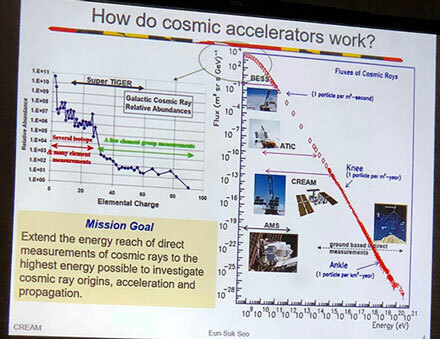 The slide below presented by the DAMPE team shows the energy range of incoming cosmic rays is measured by four different types of sensors that cover that energy range. I found the design of these sensors pretty interesting. The sensor must monitor the incoming cosmic ray and determine if the cosmic ray is charged, e.g. an electron or proton or positron, and its total energy. Also the direction which the particle enters the detector is also measured. Without going tin to the details how each of these parameters are measured, check out the DAMPE concept design below. 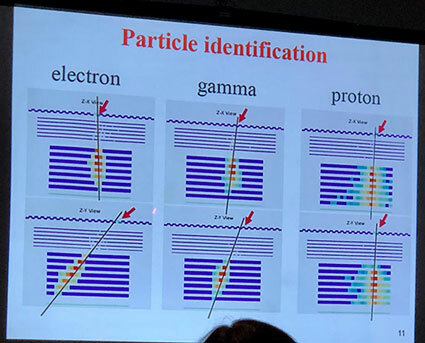 The slide below shows three examples of how different particles are detected and how the experimenter can tell which particle entered the detector. It is not quite easy to see in the photo of the slide but the charged particles, like the electron and proton, interact with the top layer (PSD) and the charge can be detected, while the uncharged particle, the gamma ray, passes through the PSD layer without triggering the sensor. The energy each particle is BGO section and the direction is measured in the STK. Finally at the end of the 5th day, the Planck team spokespeople presented half a dozen papers describing the latest Data Release 3. The Planck satellite has been measuring the cosmic microwave background ever since its launch in 2009. This third release presents the most accurate and statistically significant data with additional analysis that has resulted in the lowest random and systematic error. The data release shows the universe remains flat, Omega_k = 0.0007 +/- 0.0019, with the number of relativistic neutrinos = 2.99 +/- 0.17, and yet there remains so tension in the value of Hubble Constant, which is reported as 67.36 +/- 0.54, while one other method, based on using supernova standard candles, reports the value as 73.5 +/- 1.6. 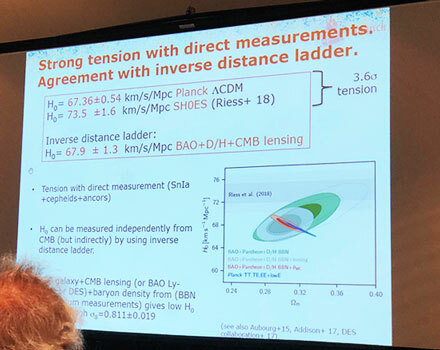 Both teams stand by their results, but the Planck team reports on the completely separate measurement team, using the inverse distance ladder, that report a value consistent with the Planck measurement. This "tension" between these two measurements is getting a lot of attention and still remains a significant issue.